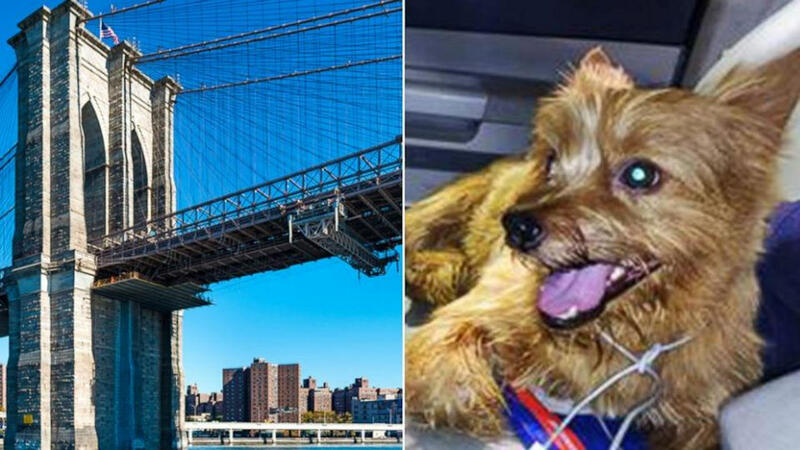 BROOKLYN, New York -- A limousine came to a halt on the Brooklyn Bridge after the driver noticed a small pup on the loose. Garrick Quinones, 52, owner of Limousine of New York in Staten Island, said he was on his way to pick up a passenger earlier this month when he saw a dog run underneath a moving car on the bridge. "I was so surprised that I pulled the car over," Quinones told ABC News today. "I just could not believe that in the middle of the roadway that there would be this dog. I was thinking, 'Wow this dog is like Toto from the 'Wizard of Oz' -- a red-haired version, an adorable little dog. I knew he needed help and I felt compelled to do it." Quinones used the cord to his cell phone charger to create a makeshift leash. With the help of a good Samaritan, he was able to capture the dog, he said. "At first, the dog was a little nervous and wouldn't let me grab his paw," Quinones recalled. "He was a well-kept and very nice and affectionate little guy. He was really friendly. He licked my hand at one point and was really grateful." Although the dog had no collar, Quinones said he appeared to be well cared for. Because the pup had a leg injury, Quinones believes he may have escaped his owner and fell from the bridge's pedestrian walkway, landing in the slow-moving traffic below. Quinones brought the dog into his limousine and got him some fresh water. He then dialed 9-1-1, asking the operator about possible reports from an owner who lost their dog on the Brooklyn bridge, he said. With no leads, Quinones said he brought the pup to the NYPD'd 19th Precinct in Manhattan, where it was discovered that the dog had been micro-chipped. The police informed Quinones that they were tracking the owner, he said. "I'm so happy," Quinones said. "He's such a nice a little dog. I just didn't know how the heck this little guy got there." The 19th Precinct did not respond to ABC News' request for comment.